Terrence Karpowicz was born in 1948 in Cleveland, Ohio and received a B.A. in fine arts from Albion College, Michigan in 1970. Karpowicz moved to New York City to pursue his career as an artist. Through various jobs, including bartending at Max’s Kansas City and studio manager of Larry Poons, Karpowicz maintained a studio and continued to paint. In 1972, he assisted with an installation of sculpture exhibition by Mark di Suvero which inspired him to sculpture; the world of materials and labor. In 1973 he enrolled at University of Illinois, Champaign-Urbana in the graduate program in Sculpture. After a distinguished graduate study that included several exhibitions (Frank Logan Medal and Prize from the Art Institute of Chicago) Karpowicz was awarded a Fulbright-Hayes Fellowship to the United Kingdom, serving as Scholar to the Wind and Watermill Section of the Society for the Protection of Ancient Buildings, to study the technical and mechanical aspects of the country’s medieval wind and watermills. Upon completing his fellowship Karpowicz moved to Chicago, Illinois in 1976 to establish a sculpture studio and continue his career. Since then, he has received two National Endowment for the Arts awards, four grants from the Illinois Arts Council, The Newhouse Award, and numerous public and private commissions. He has exhibited throughout the United States, Mexico, Europe and in the Soviet Union. 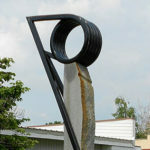 Karpowicz has received seven commissions for public sculpture from the State of Illinois and his work is held in collections of the City of Chicago, Oklahoma City, and the U.S. General Services Administration.